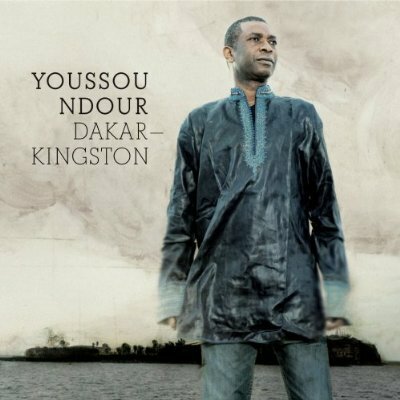 Senegal’s Youssou N’Dour, one of the greatest voices in African music (or any sort of music, for that matter), has made a reggae album. Actually, I had read a lukewarm review of Dakar-Kingston in the U.K. press last year and wondered two things: whether it was really as unexceptional as the reviewer opined, and whether the album was going to be available over here in America. Now that Dakar-Kingston has apparently gotten distribution on these shores, let’s address the first question. To my ears, this disc is, though no masterpiece, a highly enjoyable and well constructed melding of reggae one-drops, Senegalese m’balax beats and N’Dour’s soaring singing. A number of re-done songs from N’Dour’s Afropop back catalogue are given shots of reggae riddim, plus a few new ones hint at an affinity for reggae that seems to have existed all along. Reggae is, after all, highly popular and respected in its African spiritual home, and N’Dour has always been an active supporter of worthy causes (such as human rights through Amnesty International) that any conscious reggae artist could rally round. It certainly helps that the bulk of the album was recorded at Kingston’s Tuff Gong Studios with such greats as guitarist Earl “Chinna” Smith and keyboardist/arranger Tyrone Downie lending a hand and guest spots by Mutabaruka and Morgan Heritage further seeing to the reggaefication of N’Dour’s African visions. Remakes of songs like “Medina,” “Pitch Me,” “Don’t Walk Away” and “Africa Dream Again” represent both the pop-inclined and more traditional sides of N’Dour’s past works, and if originals like “Marley” and “Black Woman” sound a little trite in comparison, they’re still pretty good. Actually, the only really sour spot on Dakar-Kingston is the version of “Redemption Song” that wraps things up. It’s a noble attempt to give the tune a new African lilt, but it just doesn’t work. The weak ending aside, N’Dour does an appreciable job of helping to prove the assertion that reggae music has always been an African music.